#Trendalert - Masaba Gupta's fresh new take on this age-old tradition is bride goals! Keeping her signature style of quirky prints and out-of-the-box styling constant, her new line - Burning Garden, puts a contemporary, playful, and vibrant twist to all the traditional looks. Also, we spotted this saree on Kareena Kapoor and it’s beyond doubt she looked her most stylish self! Next up is this stunning cold-shoulder ivory maxi-dress with the ‘matsya’ motifs on it! The pink sindoor is what caught my attention here again. It’s not something we come across everyday and here’s wondering why? Finally, this knock out pink lehenga-choli with a touch of bluish-grey is pure love. Seriously digging those grey and yellow latkans on the lehenga skirt too! Girls are you taking notes? Well, I feel you Masaba and this modern and contemporary take on sindoor is just amaze! 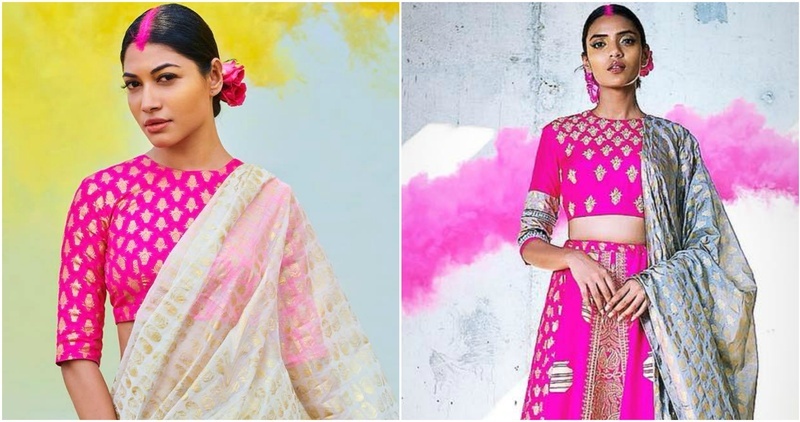 For all you girls looking to make an offbeat statement at a wedding, we say take some inspiration from Masaba’s styling and you’ll have all eyes just on you! P.S: This vibrant collection is everything that a gal needs to survive this summer wedding season!